You’re only getting a short tease this week, because I’m packing up to move, and a bunch of other things are going on, including I got to see the kid for parents weekend at his school this weekend. It’s 4 hours away, so I stayed at a Days Inn, a cheap, but clean, no-frills kind of place. But maybe it was too clean. 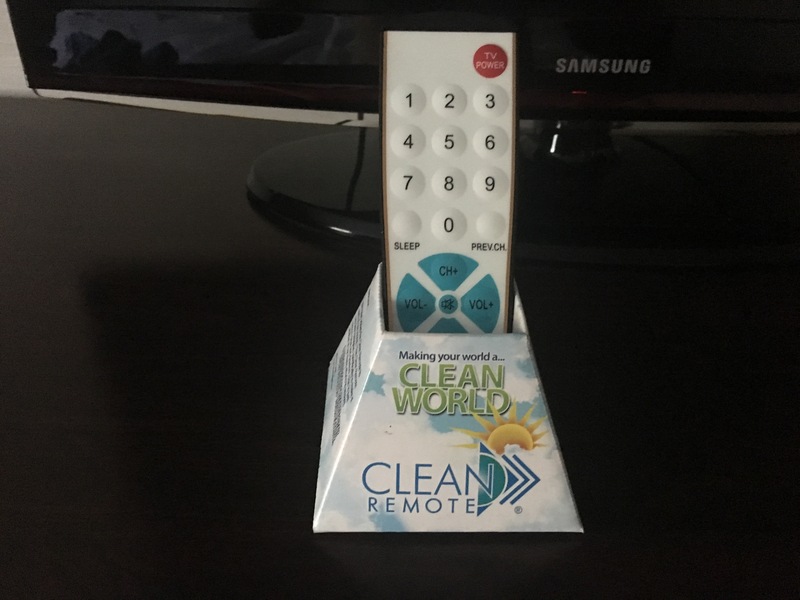 I found this little gem sitting near the TV: Hotels these days have all kinds of messages they place around the room to either tell you how efficient and all saving-the-planet they are with solar energy and washing things in a cup full of rain water collected from the green roof. Alternately they berate you to use less energy by choosing to use your towels and sheets multiple times. But I hadn’t seen this little number yet, so I took a closer look. Turns out this remote is built to allow for full disinfecting. I appreciate the effort, but 1) the rule of hotels is to work to make me think I’m the only one who has ever stayed there. Ever. So referring to disinfecting the remote very much violates that little fantasy; and 2) now I’m thinking about where that remote has been that it requires disinfectant. And believe me, as I sat staring at it from across the room, I went waaaaay past, sneezing and germ ridden kids. Suffice to say, I did not touch the remote or the TV. So maybe that’s actually how the disinfecting works. This entry was posted in family, Mid-Life, Musings, Parenting and tagged Days Inn, hotels, remotes on September 25, 2017 by sdeden. This is actually genius! Though we haven’t traveled in a while, Deb would bring anti bacterial wipes and clean the remote…. and door handles, phone, and anything else that could be touched. Ha ha! You guys are more with it than I am. I live in my own little blissfully unaware and apparently germ-invested bubble! See what I mean? It’s a slippery slope!! lol! I’m so glad you had time with the “kid.” How are you adjusting? Please pm me and let me know where you will next be calling HOME.